The Educator Sign-In page has a sign-in box for educators. Educators have professional accounts instead of portfolios. A professional account is similar to a portfolio. You can use it to sign in to the main Bridges website. Like a portfolio, it also saves your information and activities you've completed in Choices Explorer and Choices Planner. The main difference between a portfolio and a professional account is that a professional account will give you access to the Professional Tools. Without a professional account, you cannot access the Professional Tools section, which is where you will find things like tracking tools to monitor student activity. In order to create a professional account, you'll need a Professional Account Access Key. The Professional Account Access Key can be found in your welcome letter. For privacy reasons, it is important to keep the Professional Account Access Key secure and away from unauthorized users. Get the Professional Account Access Key from your site's welcome letter. Go to www.bridges.com and select the "Sign In" link for educators in the lower-right section of the page. Select the link that says Create a New Professional Account. Enter the Professional Account Access Key and the other requested information on the Create Professional Account page (see sample page below). All fields must be filled in. We strongly encourage you to enter a valid e-mail address, as the system will automatically send your professional account credentials to that e-mail address for your future reference. When you finish creating your professional account, the system will automatically sign you in. 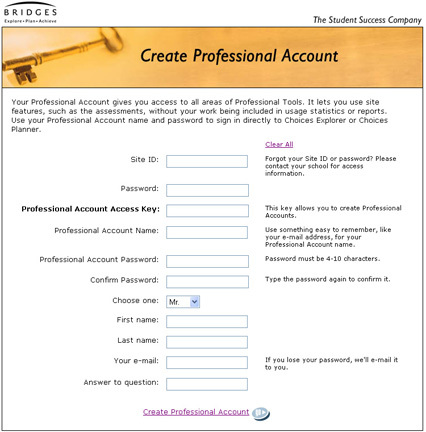 Once you've created your professional account, you may use that account name and password to sign in from the main Sign-In box on www.bridges.com, if you prefer. Just enter the account name in the Portfolio Name field. If you already have a Bridges portfolio, you can upgrade that portfolio to a professional account. When you upgrade, any previous work that you have saved to your portfolio will be moved to your professional account. To upgrade, you will need to go to Professional Tools in Choices Planner or Choices Explorer. Go to www.bridges.com and sign in with your existing portfolio name and password. After signing in, select the Educator tab. Select Choices Planner. Select the Professional Tools link located near the top of the page. Select the Upgrade Portfolio to a Professional Account link on the right side of the Professional Tools menu. Enter the Professional Account Access Key and the other required information on the Upgrade to a Professional Account page (see sample below). All fields are required. We strongly encourage you to enter a valid e-mail address, as the system will automatically send your professional account credentials to that address for your future reference. When you've finished upgrading to a professional account, the system will automatically sign you in.